The New York gambling and horse racing industries have linked up for the first time. Rivers Casino & Resort announced a partnership with Capital Off-Track Betting to offer pari-mutuel wagering on the property. It is now the state’s only casino offering horse betting to guests. Capital, which operates dozens of branches in the region, is based out of a Schenectady office about a mile away from the Rivers’ front door. The three OTB terminals inside Rivers’ Van Slyck ’s entertainment lounge went online May 4, just in time for the Kentucky Derby. In a press release, Rivers Vice President Justin Moore thanked the NYS Gaming Commission for approving the new casino amenity. The property might soon have even more new ways to tempt guests. Lawmakers are inching toward regulated NY sports betting, and Rivers is apparently eager to enter the market. Guests at Rivers should have an easy time finding the new OTB kiosks. Van Slyck’s is attached directly to the casino floor. It’s where most folks end up when they’re looking for live music or a craft cocktail, and it hosts trivia and karaoke and such, too. The spot also doubles as a sports bar, replete with television screens and pitchers of cheap beer. Now there’s horse betting, too. The bar contains two terminals, and an adjacent live-teller window offers a third. The teller is there to assist bettors with the process. Racing broadcasts occupy four of the lounge’s TV screens, each covering a different track. Just as importantly, the launch also catches the start of the live racing season in the region. More casino/betting partnerships to come? Depending on how this turns out for Rivers, competing NY casinos might consider following suit. The only real case against installing OTB terminals is that they take up a measurable amount of space. Nothing inside a casino makes money like a slot machine does, including horse betting terminals. In terms of direct revenue, it’s silly to swap any slot for a kiosk. The terminals do fit well with the current setup at Rivers, though. Rather than allocating a separate space, the property has incorporated OTBs into an existing venue. The sports-friendly bar already has video poker machines, and the general activity in the area might tempt the occasional lurker to dabble with a horse bet or two. Van Slyck’s and Rivers should expect to see small increases in foot traffic, as well. While OTBs won’t be a huge source of revenue on their own, they will attract some horse bettors who are willing to patronize other casino offerings in between races. Before last week, there was no single location where they could do both. This arrangement may also foreshadow similar NY sports betting partnerships down the road. Sports betting is similar to OTB from a casino standpoint, viewed as a guest amenity rather than a revenue source. If they were thinking about revenue, though, betting on human sports outpaces betting on horses. 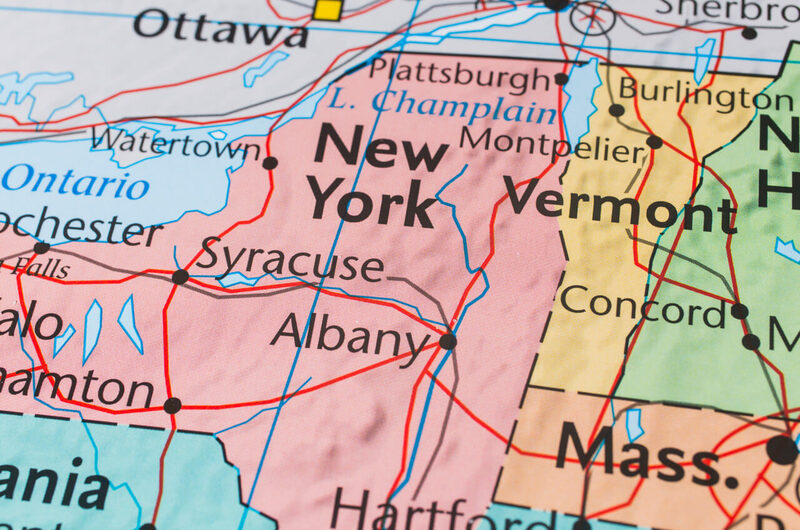 New York is one of a few states with a law allowing casinos to offer sports betting. Lawmakers have dragged their feet on finalizing the industry’s structure, partially waiting for resolution at the federal level. Until this week, the Professional and Amateur Sports Protection Act (PASPA) prohibited states from offering sports betting. Even though NY had a law on the books, it could not activate that law unless something changed at the federal level. That change came on Monday. The US Supreme Court struck PASPA down, clearing the way for state-based regulation. NY casinos may not be keen on carving out a corner of their floor for a sportsbook, but they all have some sort of sports bar in place. It’s not hard to imagine an operator setting up a sports betting window inside a spot like Van Slyck’s, even as a temporary solution. According to the Daily Gazette, Rivers’ parent company Rush Street Gaming says it would add “sports betting across all [its] gaming platforms as soon as possible.” The group’s other platforms include the online gaming clients being developed through its Interactive division. It might not even need a partner to offer online sports betting. The three other NY casinos would almost certainly follow suit, though they’ll need to source software if they want online wagering. That’s all speculation, as we haven’t heard from the competition directly. At this point, though, the struggling properties should welcome just about any amenity that might help get customers in the door.